I flew to Nevada the first week of October for a project with Ebara International. Ebara needs blankets for sound attenuation for four vessels that will be part of the largest floating natural gas platform in the world. This platform will be located between Australia and Indonesia. At the last minute, we learned from our customer that we had a 12 hour window to measure the equipment before it shipped. I was very pleased we were able to schedule our flights and provide our normal service on very short notice. All the Ebara personnel involved were top-notch, and the organization is clearly very well organized. I especially appreciated the cooperation from the shipping department, headed up by Rick Maus, for setting up the equipment in a convenient location for measurements. 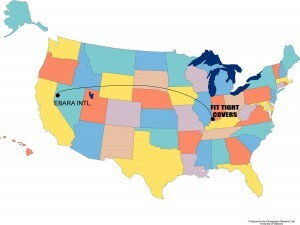 This situation demonstrates that Fit Tight Covers is willing to do whatever we can to satisfy our customers. We’re located in Evansville, Indiana, but we are willing to travel anywhere. Just give us a call, and we will find a way to get to you when you need us. More info on Ebara available at their website. We are thrilled to welcome Tony Allen to our team! FitTightCovers Fit Tight, Fits Right!